Even the most polite children often turn fiendish when ramped up on cake and ice cream, making what should be a great ending to a special day disintegrate into a gift-giving shoving match. The birthday child can become so energized, he tears open package after package, forgetting to say, "Thank you!" If this sounds familiar, read on for some tips to handle overly-exuberant children! Teaching Your Child Proper Gift-Receiving Etiquette The day before the party, sit down with your child and go over both your expectations and his. If your child is younger, practice opening gifts by handing him a small toy and having him pretend to open it. Then, coach him on ways to thank the giver. You may also want to have him practice what to say if he's given a gift he already has, such as "Thank you, I like this game". Making Gift-Opening Time Fun . . . Without the Insanity There are several fun ways to open gifts that help maintain a child's ability to focus on one gift at a time. Gift Hunt - Before the party, write clues leading to various locations in your home. For instance, "If it's a gift that you want, it's a gift you'll see . . . When you are looking behind the TV!" After the guests arrive, have an adult gather up the presents and hide them in the locations corresponding to each clue. When it's time to open presents, hand the birthday child one clue at a time. As he finds each gift, have him open it on the spot. The following two games are appropriate if every guest has brought a gift. If not, you may risk embarrassing a guest who has not. Gift Pass - Have the guests sit in a circle with their gifts in their laps and the birthday child at the head. Going one-at-a-time around the circle, tell each guest to hand his or her present to the birthday child, who stops to open each one before taking another. Musical Gifts - To make the circle strategy more festive, turn it into a game of "Musical Gifts." Position an adult near a stereo so they can start and stop a song periodically. While the music is playing, have the children pass the presents slowly around the circle. When the music stops, the birthday child opens whichever present he's holding. Continue play until all of the gifts have been opened. If many of the guests attend the same school, request that they bring a new book for the school library. If your child loves animals, have guests bring pet food to be donated to the local animal shelter. If your church or community runs a food pantry, ask guests to bring their favorite food items to donate. Ask guests to bring a toy that can be donated to a children's hospital or homeless shelter. Have a book exchange. Each guest brings a new, wrapped book to the party. The gifts are all numbered and each guest chooses a number out of a hat. Everyone unwraps the gift that corresponds to their number and everyone goes home with a new book, including the birthday child. Ask for drawings instead of gifts. Ask each guest to draw a picture of something special to them that they would want to share with the birthday child. During the gift-giving portion of the party, each guest shows their drawing to the group. You can save these drawings in a photo album or binder for something special to show your child years later. "I feel pretty strongly about rehearsing gift opening with your child, especially little ones, so they understand etiquette. On the day before the party, sit with your child and go over your expectations as well as his. For younger children, practice opening gifts. Hand your child a small toy and have him pretend to open it. Then, coach him on ways to thank the giver. You may also practice what to say if he is given a gift he already owns, such as, 'Thank you. I really like trucks.'" Is there a way to make opening the gifts less crazy? Here are a few fun ways to have the birthday child open gifts that cut down on the frenzy and help them focus on one gift at a time. Gift Hunt: Before the party, write clues leading to various locations in your home. For instance, "If it's a gift that you want, it's a gift that you'll see . . . When you are looking behind the TV!" After the guests arrive, have an adult gather up the presents and hide them in the locations corresponding to each clue. When it's time to open presents, hand the birthday child one clue at a time. As he finds each gift, have him open it on the spot. 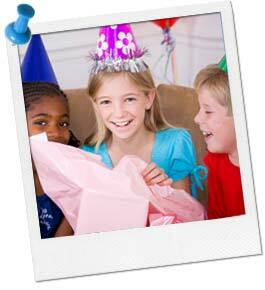 Gift Pass: Have the guests sit in a circle with their gifts in their laps and the birthday child at the head. Going one-at-a-time around the circle, tell each guest to hand his or her present to the birthday child, who stops to open each one before taking another. Musical Gifts: To make the circle strategy more festive, turn it into a game of "Musical Gifts." Position an adult near a stereo so they can start and stop a song periodically. While the music is playing, have the children pass the presents slowly around the circle. When the music stops, the birthday child opens whichever present he's holding. Continue play until all of the gifts have been opened. What if my child doesn't like a gift? There is bound to be a gift that just isn't as popular with your child as the others. This is where coaching ahead of time can be really beneficial. Make your child aware that this might happen, and make sure he knows that he still needs to thank the guest for the gift in the same way he thanked the others.